The first ski fields in Canada are now open for the winter season. 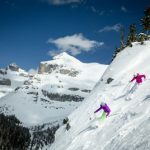 Banff Sunshine Village, Lake Louise Ski Resort and Mt Norquay in Alberta, known as SkiBig3, officially open to the public for skiing and snowboarding since 9 November 2018. With a week of cool temps and an early start to winter snowfall in the mountains, Canada’s western provinces of Alberta and British Columbia are gearing up for an epic 2018/19 ski season, with most resorts opening by the end of the month. Read on for what’s new and happening this season. Meet Monster X at Panorama Mountain Village in British Columbia. A new snowcat that’s more tiger than kitty, and roomy enough to take a dozen monster-whisperers into Panorama’s biggest terrain. Thrill-seekers will love the four double-black diamond lines available on the Monster X terrain, with easy access to the new 128 acres of terrain that were released last year. Opening weekend at Sun Peaks Ski Resort, British Columbia, is taking place in less than 24 hours! From 17 November, ski bunnies can take advantage of Canada’s second largest ski area, with its deep steeps, long cruises and corduroy groomers making up 4,270 acres of skiable terrain, nestled around a European-style ski-through village. Savour the Sun Festival is taking place for the first time from 7 – 9 December. Partnering with the Oliver Osoyoos Wine Country, visitors can enjoy a weekend of food, wine and winter adventure. The Okanagan champagne powder at Big White Ski Resort, British Columbia, is ready to be carved up, with opening day taking place on 22 November 2018. Renowned for being one of Canada’s most family-friendly destinations, the Big White Kids Centre equips all kids with complimentary helmets and Flaik GPS systems to track their lesson and results. Masters’ Week at Big White is a specially designed program for passionate skiers and snowboarders aged 50+. The program combines the best skiing and riding Big White has to offer with a series of exclusive après events including wine tastings, dining at Big White’s best local restaurants, evening sleigh rides, and more. This season will offer three seasons running from 28 January – 5 April 2019. Visitors to Mont Tremblant, in the Laurentian Mountains of Quebec, 130 kilometres northwest of Montreal, can take advantage of its expanded Adrénaline Park, with a creative assortment of modules for freestyle skiers and snowboarders of all ability levels. Celebrating its reputation for some of the best Alpine Touring in the country, Mont Tremblant offers skiers the chance to climb the designated trails up the highest peak in the Laurentians ski down one of 96 marked ski runs. New for the 2018/19 season, Whistler Blackcomb is launching a new gondola and two new chair-lifts, following a $66 million investment, the largest single-year capital investment program in the history of the resort. Visitors to the resort will enjoy shorter queues with the new facilities significantly increasing lift capacity. While you’re there, experience the summit of Whistler Mountain from a unique perspective from the new Peak Suspension Bridge and West Ridge Viewpoint. Suspended over Whistler Bowl at an elevation of 2,182 metres, the suspension bridge is the tallest in North America, offering expansive views of Whistler Village and the surrounding Garibaldi Provincial Park. The Marmot Escape Card is back at Marmot Basin Ski Resort in Jasper, Alberta, offering half price full day lift tickets, 20 per cent off junior full day lift tickets and 10 per cent off lessons. Boasting the highest base elevation of all Canadian ski areas, Marmot Basin serves up a vertical drop of 914 metres over 1720 acres of perfect terrain and alpine parks featuring jumps, rails, boxes, rails and jibs. One of the best things about Marmot is its close proximity to the authentic Canadian Rocky Mountain town of Jasper. Soak up the small-town feeling while enjoying amenities expected from a world-class winter resort.